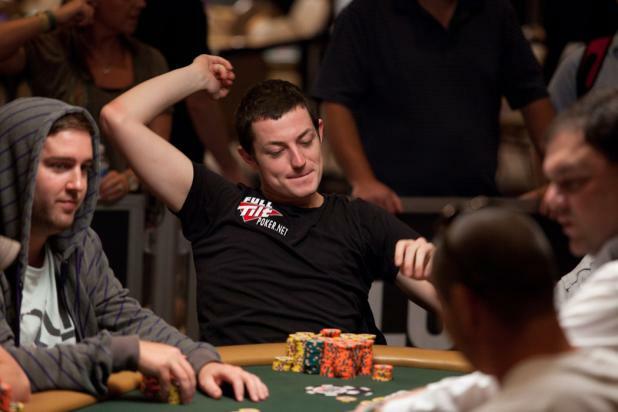 Tom "Durrrr" Dwan draws a deuce to complete an 8-5 low to win the pot and double up. As he gets up to sprint back to his primary tournament, Dwan tells his opponent, "Sorry, man." His opponent shakes his head and says, "Oh Durrrr, Durrrr, Durrrr." After Dwan leaves, his opponent says, "I shove the nine-seven, and he's all in blind. How is he even drawing live?" 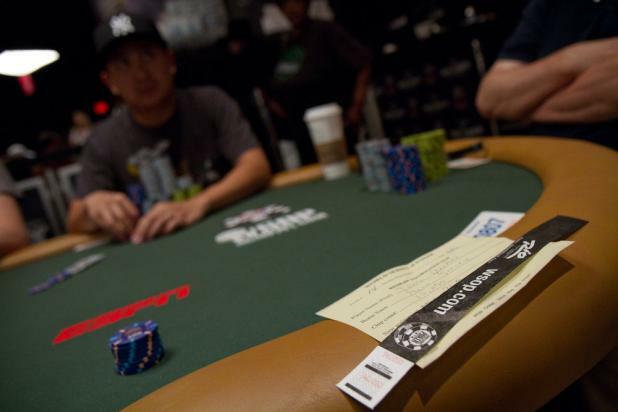 It takes at least a little luck to play two WSOP events at the same time. 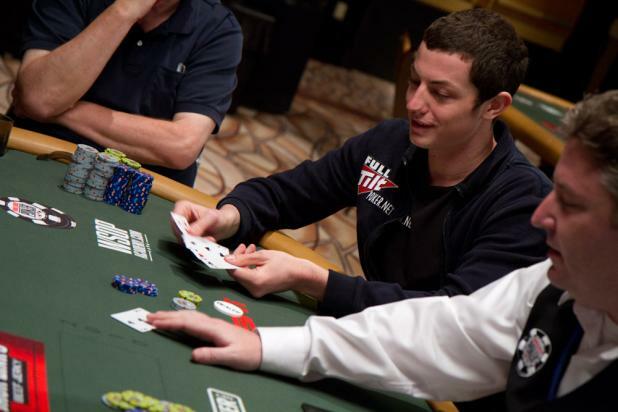 During a break in his primary action leading to the final table in Event #11 ($1,500 No-Limit Hold'em), Tom "Durrrr" Dwan runs to his chip stack in Event #14 ($1,500 2-7 Draw Lowball) to see if he can double up his short stack to survive the blinds for a while. 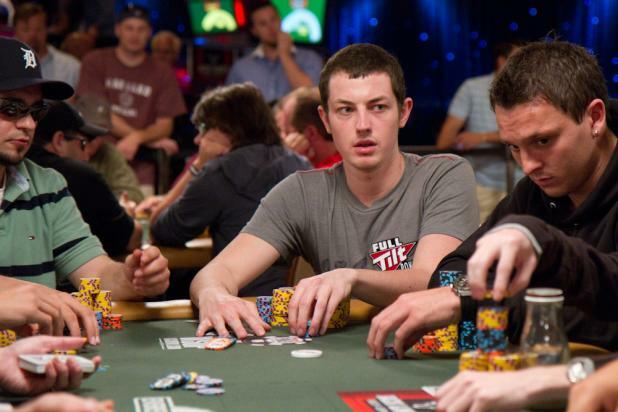 Dwan moves all in blind, hoping for some action. Tom "Durrrr" Dwan's chip stack is down to 4,000 on Day 2 of Event #14 ($1,500 2-7 Draw Lowball) before he takes his seat. Directly across from his stack sits J.C. Tran., who won WSOP bracelets in each of the past two years. With two tables left on Day 3 of Event #11 ($1,500 No-Limit Hold'em), Tom "Durrrr" Dwan is in a good mood as he retains his position among the chipleaders. 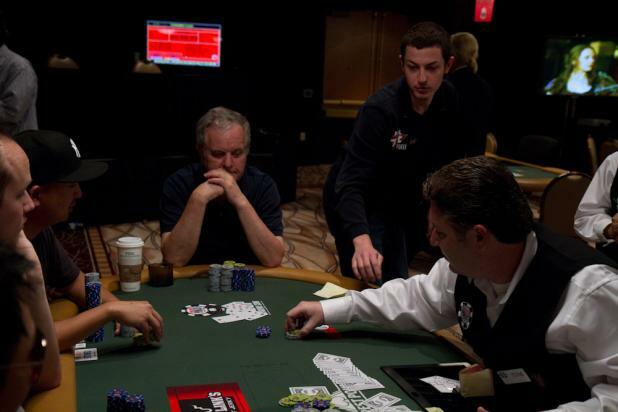 Dwan had about half an hour to focus on this event before Day 2 of Event #14 ($1,500 2-7 Draw Lowball) began on the other side of the room, where Dwan also had a chip stack waiting. After sprinting across the room, Tom "Durrrr" Dwan takes his seat in Event #11 ($1,500 No-Limit Hold'em). 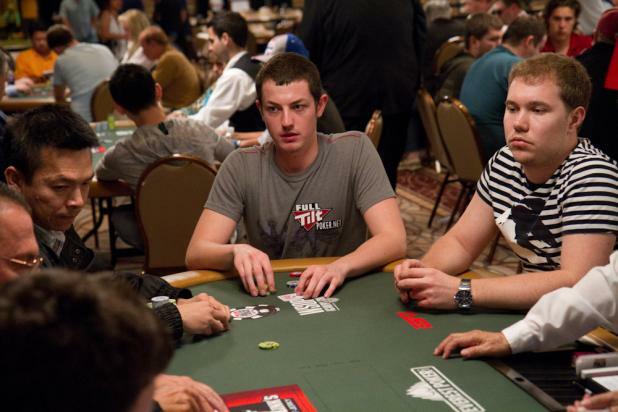 At the end of the day, Dwan was the only player with more than a million in chips with 21 players remaining. 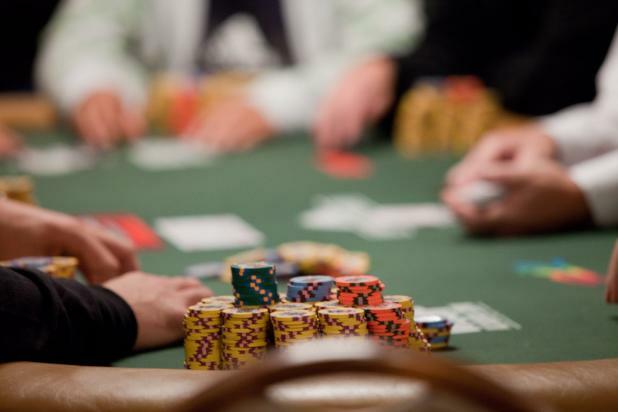 While Dwan was going for his first WSOP bracelet, lots of high-stakes players were hoping he wouldn't, collectively having allegedly bet millions of dollars against Dwan winning a WSOP bracelet in 2010. 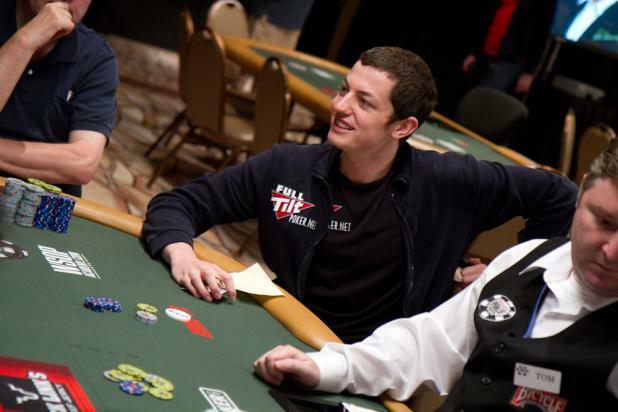 Whenever Tom "Durrrr" Dwan saw an opportunity to switch events (like a potentially long hand developing), he would sprint over to the other side of the Amazon Room to see if he could squeeze in a few hands at his other table. 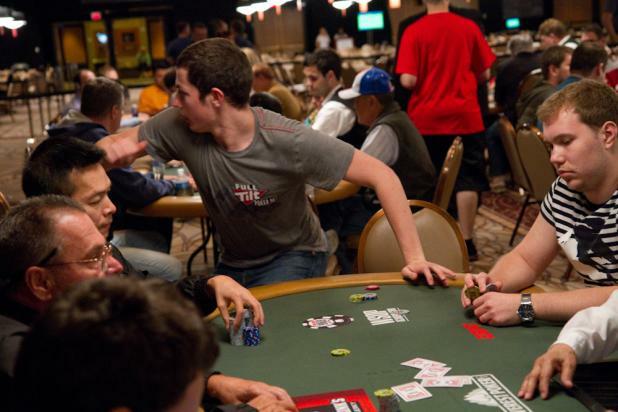 Poker may not be a physical sport, but Dwan was getting quite a workout. 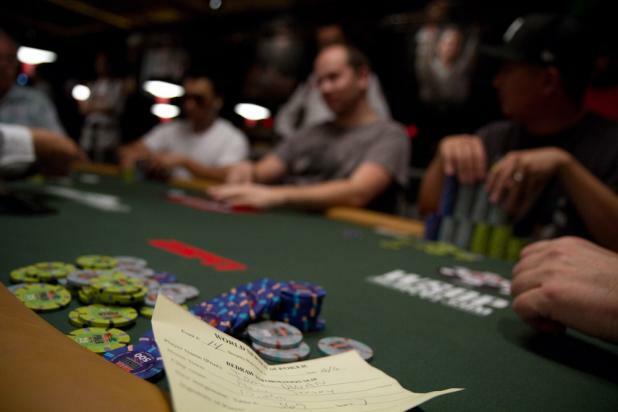 While Tom "Durrrr" Dwan was busy playing in Event #14 ($1,500 2-7 Draw Lowball), his chipleading stack in Event #11 ($1,500 No-Limit Hold'em) was slowly being blinded away. But Durrrr was never far from this stack for very long. Michael Mizrachi wasn't the only player in Event #14 ($1,500 2-7 Draw Lowball) playing two events simultaneously. Tom "Durrrr" Dwan was also double-dipping, playing this event while still holding the chip lead on Day 2 of Event #11 ($1,500 No-Limit Hold'em).